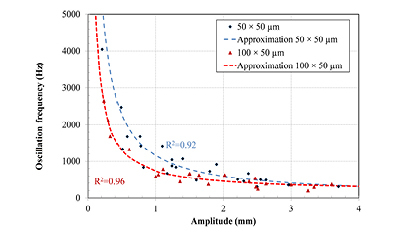 Flow boiling of degassed double-distilled water in a single 50 × 50 μm and 100 × 50 μm microchannel was investigated on the basis of experimental measurements and high-speed visualization. The visualized events during boiling were analyzed in terms of the bubble frequencies and boiling front oscillations in microchannels. A digital image sequence analysis algorithm was composed to determine the time dependence of bubble and meniscus locations. The results show (i) the dynamic characteristics of boiling in microchannels, (ii) the increase of fundamental oscillation frequencies with increasing heat flux and temperature of the microchannel bottom, (iii) the amplitudes of the flow boiling oscillations are inversely proportional to the fundamental frequencies. The outcomes of the study are important as the oscillations during boiling in single microchannels are experimentally confirmed to be predictable in terms of oscillation frequencies and amplitudes trends and dependencies. This knowledge is especially significant at constructing efficient two-phase micro heat exchangers, micro mixers or micro reactors, as the cross section and the length of the channel become exceedingly important design parameters in micro devices with boiling. Microchannels; flow boiling; oscillations; visualization; fundamental frequencies.